Father Pedro Opeka was born on 29th June 1948 in Buenos Aires (Argentina). He is a Lazarist Catholic priest to Slovene parents. He created AKAMASOA and he is famous for his struggle against poverty in Madagascar. Pedro Pablo Opeka was born on 29th June 1948 in San Martin, Buenos Aires’ suburb. His parents were Slovene refugees. At the end of World War II, his father Luis, known for his Christian convictions, was arrested and sentenced to death by Marshal Tito communist partisans. But in June 1945 he escaped death becoming the only survivor of a massacre where thousands of people died. He decided to flee his country, Yugoslavia. In a refugee camp in Italy he met and married Maria Marolt.The 31st December 1947 they boarded in order to immigrate to Argentina. Very soon, Pedro Opeka learnt construction trades, helping his father who had become a bricklayer in Argentina. He played football and wanted to become a professional player. After his baccalaureate degree, Pedro Opeka left Buenos Aires to spend the summer in a secluded region of Argentina in the Andes Mountains with Mapuches Indians. With his catholic student group he wanted to build a house which could serve as model for other villagers’ construction. Therefore, they built a first house with two students specialized in architecture. This experience, and a second one the year after in Matacos tribes close to Bolivia’s border, confirmed his vocation and choice to devote himself to poor people and God. After his pastoral and social experiences he decided on March 1966, to join the novitiate in order to become priest and start the seminary of Lazarists (order created in 1625 by Saint Vincent de Paul). He was 17. In 1968 he started to study philosophy and theology in Colegio Maximo in San Miguel (Buenos Aires suburb). In this school, future Pope Francis was ending his theology studies at the same time. On 20th August 1968, at 20, the young man left Argentina to go into his training in depth at Ljubljana University (Slovenia), the native land of his parents. His first departure to Madagascar was on 26th October 1970 where he became bricklayer in the parish of Vangaindrano (SouthEast). He also worked with Malagasy farmers and created villager groups in order to reflect together about a common project and take charge of their future. In 1972 Pedro Opeka continued his theology studies at the Catholic Institute of Paris in France because of his conviction to become a missionary. He met the ecumenical Community of Taizé near Cluny. After his studies he traveled into Israel, Russia and in the United States (New York). On 19th March 1975 he pronounced his vows of missionary in Lazarist Church of Sèvres Street in Paris. Joining the Saint Vincent-de-Paul cause he devoted his life to poor people. Then, on 29th June the same year he was ordained deacon in Ljublana cathedral. On 28th September 1975, at 27, he was ordained priest in the National sanctuary of Notre Dame of Luján in Argentina. In January 1976, Father Pedro went back to Madagascar to become vicar of the parish of Vangaindrano. During 13 years he lived with poor farmers in southeast of the great island putting into practice the Jesus example and also the example of his evangelical fraternity; that is to say serving the others. With some priests and farmers he worked in rice fields showing that no work is unworthy. Whereas he was enthusiastic with this life besides poor people as the Christ was, he found out a population surviving with a continuous hungry and where children died every day. Facing death and disease struckingresigned families who preferred leave it to Providence, he quickly reacted against this situation and tried to convince them that God is not responsible for this death. Sharing farmers’ life conditions, he fell ill several times but he fortunately could receive health cares. After experiencing this life for 13 years, weakened and infuriated to see so many poor people tormented by death, he thought about asking for a year off to recover energy: but his brothers from the Congregation called him at Antananarivo in order to become the Responsible of Saint Vincent-de-Paul Theological college training seminarians. It is over there where he has found his providential mission. In March 1989, one week after he arrivedat the capital, he was visiting some patients in the suburb when he discovered the garbage dump of the town. Here he also found one thousands of children and parents living on a mountain of trash who were fighting for food among dogs and pigs. At this moment, when he faced this apocalyptic scene of human degradation in extreme poverty, he thought “here we mustn’t speak we must act”.He didn’t know exactly what to do, but he was determinate to come back to this hell to move families and above all children out of misery. Therefore, he came every day at this dump to meet people who lived there. To get the confidence of this marginalized women and men abandoned by human community, he understood they should not be abandoned once again. He introduced himself as a priest saying that “if they love their children they have to give them a future worthy of human being”. He had been talking with them and visiting them every day for six months before he achieved convince 70 families to quit the garbage dump in order to create a new village on a land located 60 km from the town in direction of Mahajunga route, given by authorities. The first village has been called Antolojanahary which means “gift of God”. To legally formalized this act initiated by poor people, Father Pedro created in January 1990 with a dozen of young Malagasies who came to support him around the dump matter, a Humanitarian Association called Akamasoa (“good friend” in Malagasy). More than an institution it became a solidarity movement to sustain the poorest people. Akamasoa aimsfor giving back a human dignity to family that extreme poverty had forced to live in inhuman conditions. Father Pedro is convinced that this dignity could be find again if there is a structure and a human and spiritual environment which could help people to rebuild themselves. That is to say: housing, schools and employment. Through these structures, but above all with a lot of passion and human faith, Akamasoa has the goal of sustaining people without assisting them. Families and Father Pedro built together houses and the first classrooms and set up rules of life(Dina). The first houses were made of hood, the first classroom hosted few children. But since the very first months people were changing, street people started to be appeased, insults stopped, fight declined; good signs showed that they were on the right way. In October 2014, the Akamasoa Association celebrated 25 years of existence. Not only 25 years of constant struggle and fight against poverty which rule the country, but also 25 years of love for all this excluded people. 25.000 people are living in the 18 villages built by the Association: in total, more than 3000 houses have been built, but also schools, dispensaries and sport structures in each Akamasoa villages. 12.160 children have been enrolled in this schools and 517 Malagasies coworkers have been working with Father Pedro: and periodically they accept young from Europe or from elsewhere for volunteers and specific works in order to show the universality of their Humanitarian movement. The Association also employs 3145 people (quarry, building work, craft, teacher, cafeteria, and village’s maintenance staff). Actually these workers build their own town and now Akamasoa could be called “the town built by the poor themselves”. On each Sunday morning, 7000 to 8000 children and adults celebrate together the Eucharist in the covered stadium which serves as Church in Akamasoa, on the Manantenasoa hill. Two touristic guidebooks, Le Routard and Lonely Planet, encourage tourists to visiting Antananarivo to not miss and to participate in the Mass where it is celebrated the love of God with thousands of children who are singing and dancing Malagasy folk dance to praise God. On every Sunday, tens of tourists coming from all around the world attend to this unique, exiting and heartwarming prayer. Many of them affirmed they left Madagascar full of hope for this country after seeing this Malagasy youth prayed, sang and danced Life: Gif of God. Father Pedro is fighting to self-finance a large part of his Association. Indeed, although Akamasoa was declared of Public Utility by the Malagasy government in 2004, it rarely benefits from government material supports and no financing from large international organizations. Day-today the Association lives and continues its work thanks to donations from people with good will who has been mobilized by Father Pedro around his fight: people from all around the world. He meets them three time a year through conferences all across the world. 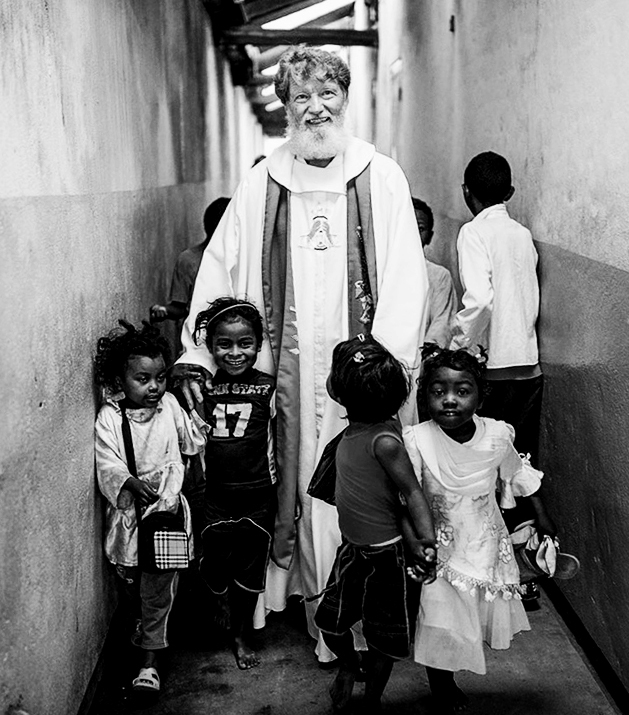 Coauthor of two books with Abbe Pierre, Father Pedro is often questioned by the Malagasy and international press. Reports about his actions are regularly broadcasting by various French TV channels and in other European countries. Books are devoted to him. In 2013 and 2015 he was nominated for the Peace Nobel Prize with the support of Slovene government and also parliamentary of France, Madagascar, European Union and also Canadian, Argentinean, Australian, Monegasque organizations and associations. Several hundred of active members support regularly Father Pedro through various associations in Europe (France, Monaco, Italy, Slovenia, Germany and Austria), North America (US), South America (Argentina) and Oceania (Australia). But with respect to thousands of people who have been helped by the Association and compared to the colossal work which need to be completed each year, supports must be searched with relentlessness. Prize “CuoreAmico” (Heart Friend) in 2003. This prize is awarded every year in order to bring to light the great work of the Church. Prize of “Oiseau d’Or”, in Slovenia in 196 by Humanitarian Act.